FORT LEE, N.J. -- Seventh-grader Briana Lopez, of Fort Lee, is seeking someone, but she doesn't yet know their name or their face. Her leukemia has relapsed, and she and her family have helped organize five donor registry drives on Sunday, Feb. 12 -- in four different states -- to try to find that person. 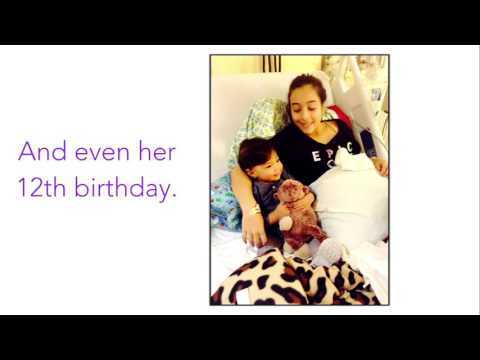 While Briana does need a bone marrow transplant, these events are not just for her. Among the many donors who get their cheeks swabbed and join the registry, many other people in need of a cure may find one. "If you're on this registry, it's not just to save Briana," her mother Yanine told Daily Voice. "You could be a match for others who are waiting for a match." Briana was diagnosed with leukemia last January, and her family went through the waiting and hoping process of trying to find a donor. They actually found two, but the doctors ruled out one as too old -- and the second person backed out at the last minute, Yanine said. "We couldn't wait any longer, we couldn't keep doing chemo," she said. So Yanine gave her own bone marrow to try to save her daughter. "I was never a 100 percent match," she said, "but they decided to use me." All parents are a half-match for their children. Eight genetic markers are used to determine a match, and the more of the eight match, the more likely a transplant is to succeed. Briana and her mom underwent the bone marrow transplant last July -- and Briana went into remission. The 12-year-old still needed to check in with her doctors regularly, but the family then focused on raising awareness about children's cancer -- including through the Madonna 5K Walk/Run this past fall, as the Daily Voice reported. Max Almenas, Director of Religious Education and Youth Ministry at Church of the Madonna, said the turnout was great, with nearly 300 participants. "It was truly a community event," he said. It had good support from Fort Lee's mayor and council, the police department and a variety of area schools. But in late October, Briana developed a bump on her head. Doctors found three malignant tumors: two on her head, which they were able to remove, and one on her eye, too dangerous to remove surgically. The Lopez family is again searching for a person who might be able to save Briana's life. Friends and family are also trying to accelerate the process: Briana's godfather is hosting a registry drive in San Antonio, Yanine's best friend is hosting one in Miami, and Yanine's half-sister is bringing the cause to the University of Georgia. The donor registry drives are being held in partnership with Be the Match, a nonprofit operated by the National Marrow Donor Program, and the Icla da Silva Foundation. "Not everyone makes it through the year," Yanine said. And Be the Match is more specific: "Each hour, more than six people die from a blood cancer." Almenas recounted one close-to-home story: "There was actually another Brianna in Fort Lee -- but spelled with two Ns -- who was suffering with a cancer. They were in rooms next to each other and actually became friends." "She had complications and died, waiting for a second donor," Yanine added. But her family has continued to help raise awareness, for Yanine's Briana, Almenas said. "Even in loss, there is hope. When we lose one in our family, we continue to push for each other." Almenas has had his own cheek swabbed and is in the registry. "When I had first learned of Briana's condition, I attended the first bone marrow drive," in March of last year. I did the swab, which was really easy, and I stayed, volunteered to greet people. From that point forward, I just fell in love with the family, and their effort to save their daughter's life. I have a 16-year-old son, and I can't imagine going through this. "I feel like you're a part of our family, now," Yanine added. According to Be the Match, one out of every 40 registry members might be called for additional testing, and one in 300 may be determined to be a best possible donor -- but not all selected donors end up donating. Approximately one in 430 do actually donate. And it's not necessarily bone marrow. Sometimes the donation might be a peripheral blood stem cell donation instead, which doesn't involve surgery or anesthesia. Optimal matches are between 18 and 44: younger folks can't legally give consent, and older donations aren't as successful. Additionally, matches are more common between donors and patients with similar ethnicities. "I want people to know that Briana's background is Hispanic," Yanine said. Hispanic people currently make up only four percent of the registry, she added. According to Be the Match, besides Hispanic donors, a variety of ethnicities are needed, to diversify the registry: African American, American Indian or Alaska native, Asian, native Hawaiian or other Pacific Islander, and multiracial folks generally. Almenas stressed the importance of spreading awareness about these issues. "Even if you or someone in your family isn't suffering from leukemia or something that requires a bone marrow transplant, they might in the future, and this would help you find a match." There are also a variety of ways that people can help, even if they aren't comfortable with the idea of donating bone marrow. People can host their own donor drives and share information about the cause on social media. You can also come to the registry event and donate money, either to help with the Lopez family's expenses or to Be the Match. The lab fees and other costs associated with processing each new registry member average $100. A friend of the family has also set up a GoFundMe campaign, so folks can also donate toward the Lopez family's expenses. Find the details here. "It's possible the drive could result in a match for Briana and help save her life -- or any one of thousands of others who are also in need of the kindness of a friend or stranger," Almenas said. "Just come out, and 'Be the Match.' Even if you don't think you're going to register, come out to show support. It's a great opportunity to get a sense of what community can do when it works together." The Fort Lee registry drive will be at the Fort Lee Recreation Center, 1500 Eighth St., from noon to 4 p.m. The other New Jersey event will be in Union City, at the Park Performing Arts Center, 560 32nd St., from 2-6 p.m. If you can't make it to the registry drive on Feb. 12, you can also sign up online, and Be the Match will send you a swabbing kit and instructions. You can do so here. You can also click here to make a tax-deductible donation to Be the Match. For more information about Be the Match, visit its website or call 800-MARROW-2. You can also follow Briana's battle against cancer on Facebook, here.